Usain Bolt's training diet of Chicken McNuggets might be good for sprinters, but distance runners carbo-load. And beer is apparently like rocket fuel. 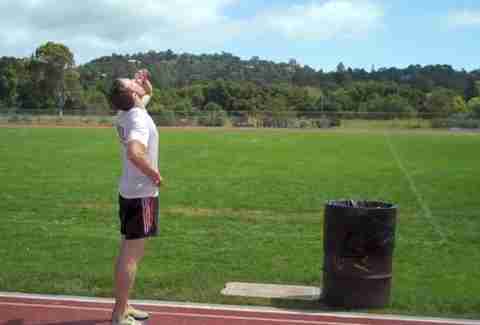 Canadian runner James Nielsen just set a new record for the "Beer Mile", which is a real phenomenon that requires you to chug one brew for each of the four laps you take around the track. Nielsen managed to do the whole thing in just 4:57 this past Sunday, ousting the previous champion Jim Finlayson, who ran it in 5:09. That calls for a celebration. Probably with a fifth beer. Watch his entire achievement above. Kristin Hunt is a food/drink staff writer for Thrillist and has neither run a mile nor chugged four beers in less than five minutes. Follow her to lazier aspirations at @kristin_hunt.